The global economy started 2018 with strong, synchronized growth. But as the year progressed, momentum faded and growth trends diverged. The US economy accelerated, thanks to fiscal stimulus enacted early in the year, while the economies of the Eurozone, the UK, Japan and China began to weaken. These divergent trends will persist in 2019. IHS Markit predicts global growth will edge down from 3.2% in 2018 to 3.1% in 2019, and keep decelerating over the next few years. At the same time, the combined effects of rising interest rates and surging equity and commodity market volatility mean that financial conditions worldwide are tightening. These risks point to the increasing vulnerability of the global economy to further shocks, and the rising probability of a recession in the next couple of years. Based on estimates about sustainable growth in the labour force and productivity, we assess the trend, or potential, growth in the US economy to be around 2.0%. In 2018, US growth was well above trend at 2.9%, though the acceleration was almost entirely due to a large dose of fiscal stimulus in the form of tax cuts and spending increases. The impact of this stimulus will still be felt in 2019, but will diminish as the year progresses. As a result, we expect growth of 2.6% in 2019 - less than in 2018, but still above trend. Eurozone growth peaked in the second half of 2017, and has declined steadily since then. IHS Markit predicts a further decline to 1.5% in 2019. Political uncertainty, including Brexit, challenges to Emmanuel Macron's government, and the winding down of Angela Merkel’s chancellorship, are contributing to a decline in business sentiment. Economic factors such as the tightening of credit conditions and heightened trade tensions are also driving the deceleration in growth. Japan’s economy is expected to expand by 0.8% in 2018, with this rate increasing only slightly in 2019 to 0.9%. The slowdown in China’s economy and the fallout from trade tensions between the US and China are drags on growth. Monetary policy will continue to be ultra-accommodative next year. The cyclical decline in Japan’s growth is occurring in an environment of very weak long-term growth. Adverse demographics - specifically a declining labour force - are not being offset by strong enough productivity growth. The “third arrow” of Abenomics, which was supposed to implement significant structural reforms and boost productivity, has been slow to materialize. The quarterly rate of Chinese growth has been steadily edging down since the beginning of 2017, hitting its lowest level in 10 years in the third quarter of 2018. On an annual basis, the pace of expansion has slowed from 6.9% in 2017 to 6.6% in 2018, and will fall further to 6.3% in 2019. 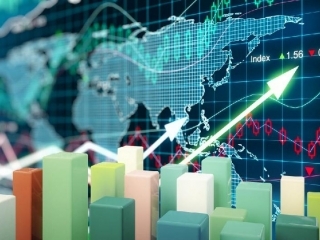 In response to recent economic shocks - including the impact of US tariffs, which has so far been limited - policy-makers have unleashed a series of monetary and fiscal measures to help support growth and stabilize financial markets. However, these measures are likely to remain modest. Credit growth will continue to be constrained by the massive debt overhang and the government’s commitment to deleveraging, at least in the medium to long term. On the other hand, the government’s stimulus efforts may well become more aggressive if trade tensions with the US (re)escalate and growth is seriously damaged. 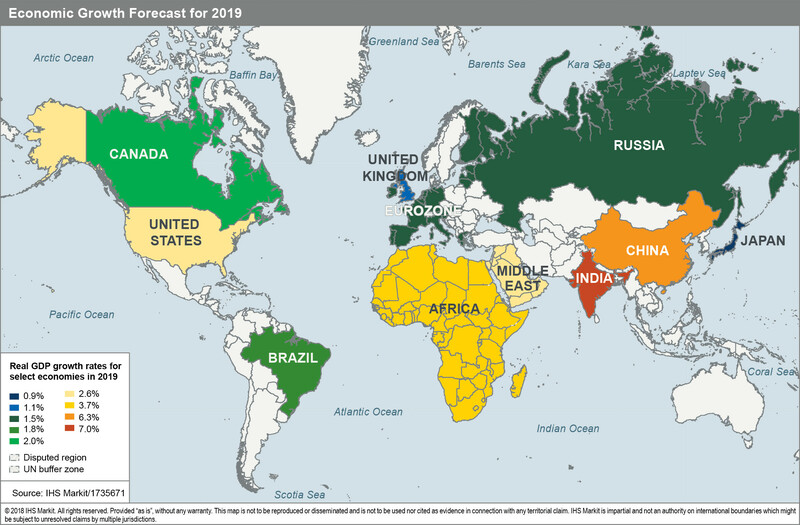 Some economies, including Brazil, India and Russia, experienced a mild pickup in growth in 2018, while others, such as Argentina, South Africa and Turkey, came under intense financial pressure and suffered recessions or near-recessions. Going forward, emerging markets face a number of headwinds, including slowing growth in advanced economies and in the pace of world trade; the strong US dollar; tightening financial conditions; and rising political uncertainty in countries such as Brazil and Mexico. A few countries will be able to buck these trends, especially dynamic economies with low levels of debt, notably in Asia. Demand growth next year still looks strong enough to provide commodity markets with support, making the kind of price collapse seen during 2015 unlikely. However, volatility in commodity markets will continue in 2019, particularly in oil markets. We predict oil prices will rise a bit in the near term and average around $70.0 per barrel over the coming year, compared with an average $71.0 in 2018. That said, the risks to prices of oil and other commodities are predominantly on the downside, given slowing demand growth and rising supply. Despite volatility, we predict that by the end of 2019, prices will be little different from their current readings. Most of the rise in consumer price inflation between 2015 and 2018 - from 2.0% to 3.0% - was due to a transition in the developed world from deflationary, or near deflationary, conditions to inflation rates that are close to central banks’ targets of 2.0%. Over the near term, we expect global inflation and developed economy inflation to remain close to 3.0% and 2.0%, respectively. While there will be upward pressures in many economies as output gaps close and unemployment rates fall - in some cases to multi-decade lows - there are downward pressures as well. Outside the US, growth is weakening. Moreover, relative to 2018, commodity prices will be relatively flat on average in 2019. Finally, with the trade war in a “temporary truce”, the upward push from tariff increases will be on hold. With the world’s key economies at different points in the business cycle, it is not surprising that central banks are moving at different speeds and in different directions. However, given weaker growth and muted inflationary pressures, the pace of removing accommodation is likely to be even more modest than previously expected. The US Federal Reserve is likely to raise rates three times in 2019. Other central banks, including the Bank of England (depending on the Brexit process), the Bank of Canada, and a few emerging market central banks - such as those in Brazil, India and Russia - may also raise rates. The European Central Bank will not hike rates until early 2020. Similarly, we do not believe the Bank of Japan will end its negative interest rate policy until 2021. The People’s Bank of China is the one major central bank moving in the opposite direction; worried about growth, it is providing modest stimulus. Continued above-trend US growth and more rate hikes by the Fed are the primary reasons for this anticipated strength. Given the recent relative calm in forex markets, especially relative to emerging market currencies, another big appreciation of the US dollar seems unlikely. Nevertheless, the potential for volatility remains very high. Political uncertainty in Europe could be very negative for the euro and sterling; we expect that the euro/dollar rate will end 2019 at around $1.10, compared with $1.14 at the end of 2018. At the same time, we predict that the renminbi/dollar rate will hold fairly steady just below the psychological level of 7.0 - the result of the Chinese government’s desire for financial stability. Policy mistakes remain the biggest threats to global growth in 2019 and beyond. The simmering trade conflicts are dangerous, not because they have done damage so far - they haven’t - but because they could easily escalate and get out of control. In addition, rising budget deficits in the US, high debt levels in the US, Europe and Japan, and potential missteps by key central banks all pose threats to the global economy. The good news is that the probability of such policy mistakes seriously hurting global growth in 2019 is still relatively low. However, IHS Markit believes that the risks of damage from policy mistakes will rise in 2020 and beyond, as growth slows further.